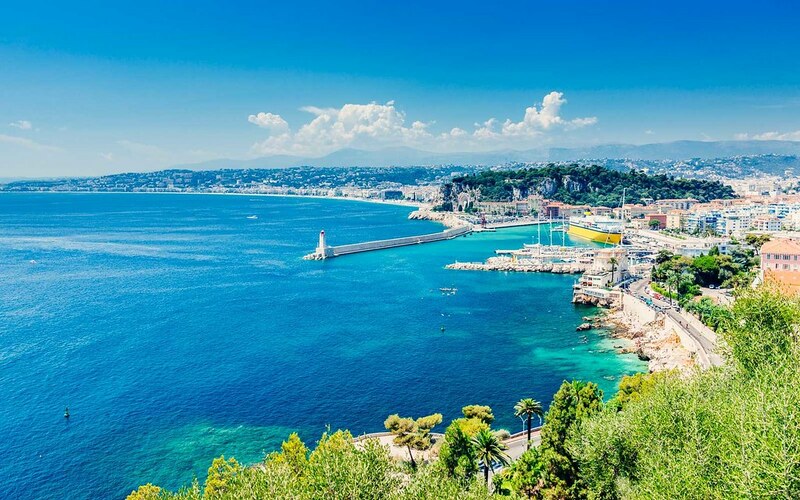 As the prime port town of the French Riviera, Nice attracts beachgoers, history buffs and high culture seekers who come to vacation on its Mediterranean shores. There’s definitely more to this quirky city than a pebbly waterfront, pastel-coloured buildings and palm trees waving in the breeze. Baroque churches surprise you in the maze of the Old Town’s twisted streets; modern sculptures dominate the gardens as you stroll in the Place Masséna; ancient Roman ruins provide the backdrop for summer jazz concerts in Cimiez; and the candy-colored onion-shaped domes of the St. Nicholas Russian Orthodox Cathedral tower overhead as you pass Avenue Nicolas II. But Nice’s cultural charms are often interwoven (and sometimes overshadowed) by its reputation for partying. Be sure to leave a little energy for the vibrant nightlife along the Riviera. 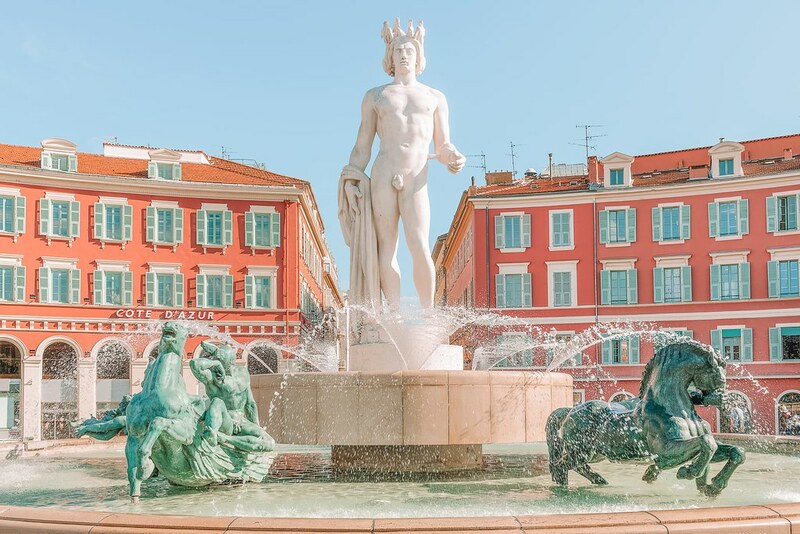 The best time to visit Nice is in the shoulder season of September to October, or from mid-March to April when you can capitalize on the low room rates. You can take advantage of the Mediterranean weather all year-round, but average high temperatures range from the mid-50s in the winter to the low 80s in the summer, and the city sees sunny days more than half the year. However, despite the sun’s warm rays, many recommend packing some extra layers of clothing, even in the summer, since winds sweeping north off the Mediterranean Sea can be slightly chilly. Be wary of private beaches Areas of the beach are cordoned off by restaurants and other seaside business (they can be crossed near the waterfront), which ban outside food and drink, as well as charge you upward of 20 euros (around $25) just to lounge. The public beaches might not come with chairs, but at least they’re free. Book smart Hotel rates become more affordable from both mid-March to April and September to October. Smaller hotels in the Masséna and Old Town neighbourhoods tend to be more affordable as well. Skip the cab Taxi drivers in Nice are infamous for their swindling of tourists and locals alike. Save yourself the hassle and take an Uber or a bus. Or, rely on your own two feet. It is polite to greet everyone you encounter with a friendly bonjour (“hello”) upon arrival, and an au revoir (goodbye) when leaving. Shaking hands is a common way to greet an acquaintance, while it is common amongst friends to double-kiss (Faire un bisous) when saying hello and goodbye. Aside from bisous, the French do not interact physically in the same way Americans do. If you are directly addressing someone you do not know well, do so formally by referring to them as Monsieur or Madame until told otherwise. If you’re dining out in Nice, you should note the French eat with both hands on the table and always with utensils. The only time you should use your hands is when you are eating bread (which is generally used to push food onto your fork). Never bite directly from a whole piece of bread, rip off bite-sized pieces instead. You can also use your bread to wipe your plate clean. Gratuity is generally included in the bill, but it is customary to round the total up or add an extra 5 percent for extraordinary service. A 10 percent tip is acceptable for maid service at a hotel, as well as for taxi drivers. The official currency in France is the euro, and one euro is equal to approximately $1.23 but the euro to U.S. dollar rate often fluctuates, so check the latest exchange rate before you go. If you find yourself short on euros, almost all restaurants and hotels also accept major credit cards. The food you find in Nice is lighter than in other French cities. Niçois cuisine is a mixture of traditional French ingredients, fresh cheeses, meat and vegetables, but with a twist of Mediterranean flavour. Its location on the coast means that seafood is a staple as seen in the renowned salade niçois, which combines fresh tomatoes, mixed greens, tuna, anchovies and green beans in a light olive oil dressing. Other local favourites include Italian-inspired pissaladieres, small pizzas covered in anchovies and caramelized onions. 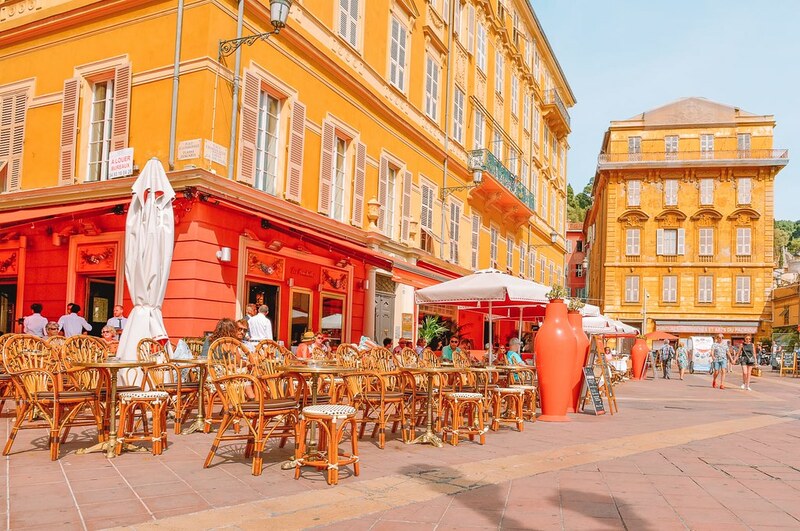 You can find the largest number of traditional Niçois restaurants clustered on the small streets of Vieux-Nice (Old Town) and the Port District. Restaurant Le Frog is a popular eatery near the coast that specializes in the classic Mediterranean variations of French dishes. Recent visitors praise the establishment’s escargot (snail appetizer), in addition to its entrees and drinks. Some travellers recommend eating at one of the smaller, less expensive pubs or restaurants around the Cathédrale Sainte-Réparate near Place Rossetti in Vieux-Nice. Les Gaiçons is one of these options, where visitors can choose gourmet French cuisines like foie gras from a constantly rotating menu. When you’re looking for a restaurant, be sure to explore. There are casual gems hidden in seemingly uninhabited alleyways, while fancier establishments sit along the Promenade des Anglais (Walk of the English). Similar to many European hot spots, Nice is generally safe but also deals with its fair share of pickpockets. Experts suggest that you not to carry anything valuable or difficult to replace in your pockets. Keep an extra watchful eye on your valuables in commonly targeted areas like buses and restaurants. In recent years, terrorist attacks have become increasingly more common in Western Europe. According to the U.S. Department of State, terrorist groups continue to plot attacks, so increased vigilance is required. Travellers should stay aware of their surroundings. Consider enrolling in the Smart Traveler Enrollment Program to receive security messages and follow local media to stay informed. The best way to get around Nice is on foot, especially if you plan on sticking close to the city’s centre. Like many other French cities, Nice is equipped with a reliable and convenient public transportation system. Buses serve all major tourist attractions as well as the Nice-Ville train station and the Nice Côte d’Azur International Airport (NCE). Ride-hailing services, such as Uber, are also a popular option now because they are much cheaper and convenient than the traditional taxis. If you decide to take a taxi from the airport to the centre of Nice, expect to pay a flat rate of 32 euros (around $39). Driving is not recommended as traffic can be frustrating and parking limited.